What are USB standards 1.0, 1.1, 2.0 and USB bus speeds 1.5Mbps, 12Mbps, 480Mbps? USB was initially release in version 1.0 in 1996, which was soon upgraded to 1.1 in 1998 and supports 2 bus speeds - Low Speed (1.5Mbps) and Full Speed (12Mbps). 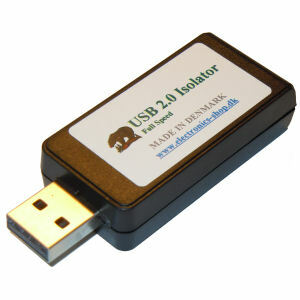 USB 2.0 was released in 2000 and supports Low Speed, Full Speed and High Speed (480Mbps). A USB 2.0 device can either be Low Speed, Full Speed or High Speed. Devices are mostly backward compatible to support lower speeds - but this is not a demand. USB2ISO support 12mbit Full Speed only. A 480mbit device and HighSpeed USB host (PC/HUB) with the USB2ISO in between will fall back to 12mbit - some devices needs the full bandwidth to operate correctly. Low speed devices which are keyboard, mouse, etc. do not work with the USB2ISO out of the box. The USB2ISO can be delivered in low speed edition (Stuffing option) - if anyone wants this please write an email and we will add the low speed product to the shop. A quality cable USB/SPDIF will not remove the degradation of sound when using an USB->DAC or an USB->SPDIF adaptors and thereby creating a ground loop. The problem is that a small difference in ground level will influence the audio signal. Prober grounding technique with a thick green/yellow ground wire will help the best - but the problem can still exist as the DACs deliver audiosignals with signal level of only 100mV (0.1V). The so called quality USB and SPDIF cables are only good for a few purposes - extending the limit of cable length or/and if they have a huge chunk on it - remove EMC problems that would otherwise prohibit the device from being sold. Some USB cables have built in power noise filtering - they might be good for low cost USB->DAC/SPDIF. Still needs to be used with the isolator and No guarantee, they will improve your audio signal. External powersupply is not a good solution. The powersupply must be totally isolated (Class 3) to avoid making a new ground loop connection - most small DC power adaptors are Class 2, which have a cap to ground. The powersupply noise on the 5V will not influence the audio signal, because most audio DACs use 3V which they get from at LDO inside the DAC module. Also remember that the noise is ontop of 5v and easily cleaned by the caps used inside the DAC module. A standard PC can have noise in amount of 250mV - but will be reduced to 50mv through the isolated DCDC. USB signal jitter does not influence the audio signal. But USB is quite a hassle for audio designers because it is packet based and the packets are not spaced evenly. The jitter in packets is solved in many ways. The Analog Device Adum chip used in the USB2ISO will not remove signal jitter and will not introduce any jitter. All full-speed USB devices working great with USB2ISO!! Please report if you find a full speed device that does not work problem free with USB2ISO, thanx! Buy your USB 2.0 Full Speed Galvanic Isolator here..